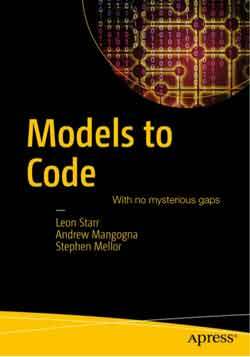 Models to Code with no Mysterious Gaps. New book from Starr, Mangogna & Mellor. Model Integration focus on the critical problems teams encounter with model based development on real projects. They don't just teach the notation for a model element. They show examples of where to and where not to use it. They discuss the consequences of one modeling solution versus another. But most importantly, they take a step back and focus on the harder problem of developing useful abstractions before you even begin drawing model symbols. “Leon is, quite simply, one of the best modelers I have ever worked with. Having consulted on a broad spectrum of applications, he is especially adept at uncovering and understanding the underlying requirements for a system, even when he has not yet worked in the subject matter at hand. Leon then puts that understanding, along with his experience in embedded and scientific applications, to work as he determines which abstractions will lead to the most efficient model-based solution to the problem. With a great sense of humor and a love for teaching and consulting Leon is one of the most entertaining and engaging people you will ever meet.” October 30, 2007. “Leon was hired to provide training on Executable UML modeling. As a trainer, he was engaging and demonstrated knowledge in both previous application of the subject matter and approaches to applying it with respect to our product lines. I have also read Leon's books and interacted with him at various times since the training. I consider him to be an expert in his field.” September 14, 2007. “Leon (along with other luminaries like Stephen Mellor) literally wrote the book on Executable UML, which is changing the way that software development is done, especially in the realtime, embedded & safety-critical world. Why shouldn't your documentation be the same as your code be the same as your high-level model? Leon explains how to do that, cleanly, crisply and clearly. A smart guy, a great speaker and a pleasure to work with.” September 13, 2007. Richard Soley, Chairman and CEO, Object Management Group, Inc.
“I worked with Leon many times over the duration of his contract at St Jude Medical. I also attended a 4-day UML class he taught in-house. Leon is a great instructor. His course material is complete and his classes are well-prepared and interesting. Planning to actually use UML? Must read this book! Any developer who is currently using or is planning to use UML on a real project should read this book. Successful completion of one or more Class Diagrams is an essential step for every UML project. This book provides the developer with the information needed to create rock solid Class Models (Class Diagrams augmented with supporting documentation to enable review by other developers). The book is very detailed and yet is written in an easy-to-read and entertaining style. Numerous informative examples are included to reinforce comprehension of the essential topics. The basic elements of the Class Diagram (Classes, Attributes, and Relationships) are defined simply and clearly. Categories of each of these elements are then enumerated. Each category is then supported by at least one easily understood example. An especially useful spectrum of Class categories spanning from the concrete to the abstract is presented. The class categories of hard/physical, discovered, invented, simulated, specification, incident, interaction, and role are covered in detail. Even if you have been building class diagrams for some time, you will likely benefit from several chapters on advanced relationship topics. These topics include Loops and Constraints, Advanced Generalization Relationships, Reflexive Patterns, Network Patterns, Linear Patterns, and Tree Patterns. You will be intrigued by the introductory section "What is Executable UML?". This section contains a concise yet exciting description of where the UML is currently headed. For more details on this evolving aspect, you can read about the Action Semantics extension to the UML and the Model Driven Architecture initiative (MDA) of the Object Management Group. More technical works should be written like this!!!! I've read more than my share of technical texts over the years. With a few exceptions, most are dry, difficult to understand and cover too much material without developing any topic particularly well. Leon Starr's book "Executable UML: How to Build Class Models" is refreshingly different. Not only is it written in a uniquely engaging style, but it does a fantastic job of developing the concepts that go into Executable UML class modeling. Furthermore, his introduction "What is Executable UML?" is the best concise overview of the topic I have *ever* read. In under 25 pages, Leon hits every major point of discussion in Executable UML in enough detail to provide real value for the reader. Although it's well worth reading for anyone who's interested in Executable UML modeling, I would especially recommend this chapter to anyone who is *new* to Executable UML, and wants to understand what all the fuss is about. Leon's approach to the subsequent chapters on class modeling doesn't bog down the book with a complicated discussion of an abstract (and potentially complicated) topic. His discussion is clear, concise, with frequent use of examples to hammer home his points. He always provides a brief scenario before he launches into a modeling example, giving a excellent context for why he used certain modeling techniques. For beginners in Executable UML, this is an excellent way to get into the mindset of modeling. More experienced readers can also benefit a great deal from the best practices discussed. Another myth about technical texts is that good content = dry read. Not so! Leon's book is *very* entertaining. This has got to be one of the most pleasant technical reads out there. Interestingly enough, when I turned the final page, not only had I enjoyed the journey, but I found that I *really* understood the topic. More books should be written like this! "Executable UML: How to Build Class Models" is the exception that *should* become the rule. I've had one of Leon Starr's other books, "How to Build Shlaer-Mellor Object Models" on my bookshelf for many years and used it as a constant reference for my OO training and documentation work. I have always liked the way Starr manages to simplify conceptual information in an engaging and down-to-earth manner - something that is close to my heart as a veteran educator. "Executable UML" builds on the models he introduced in his previous book and moves from the S-M world to the executable UML world. I thought the book was very well written and gave a good, clear explanation of what Executable UML actually is and how it extends the UML. The examples Starr uses to explain some of the more abstract ideas and concepts were great and his treatment of relationships and associations was excellent I thought. As well as the clarity of the writing I particularly appreciated the sense of humor in this book - something sadly lacking in many methodology texts. I've been using this book as well as Mellor and Balcer's book "Executable UML - A Foundation for Model-Driven Architecture" as references in developing xtUML online-learning courses and found them both invaluable. Great book - highly recommend it. Excellent about UML, not much about "executable"
I was disappointed with this book because there is nothing here about UML action language or constraints. That's what I thought "executable" meant, but I obviously got something wrong. The book is the best I have read class modeling, though. If you want to learn practical UML modeling, I strongly recommend this book. Merge är ett avancerat och visuellt verktyg att jämföra och synkronisera filer, mappar och kataloger från Araxis Ltd. Verktygets gränssnitt finns till följande språk: Engelska, Tyska, Franska, Internationell Spanska, Japanska och Kinesiska (traditionell och förenklad). Ketura är en mjukvaruapplikation för att hantera projekt som är i ständig förändring, har hög komplexitet och där det finns en önskan att erhålla ett professionellt stöd som verkligen kan förenkla arbetet. Software Management när den är som bäst!